Normally, when an all black SUV with Federal Government license plates rolls up on you at an airport … it’s usually a time for concern. However, that was not the case Monday at the DOG Aviation hangar … in fact, much to the contrary, it was a most welcomed sight. The black SUV’s doors opened and three representatives from the FAA’s Cleveland MIDO (Manufacturing Inspection District Offices) facility exited the vehicle to greet me. 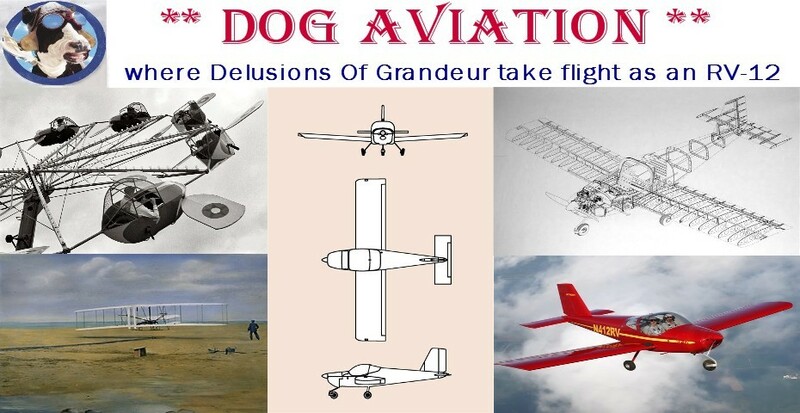 Mr. Richard Greenlief, a Senior Aviation Safety Inspector and Small Plane Directorate, was the first to speak and said not be alarmed … normally he would be the only Fed doing the inspection, but he had brought a couple of his newer employees along for some on the job training. 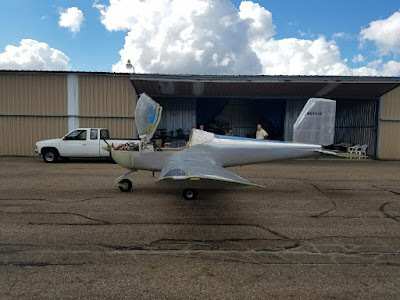 I was introduced to Mr Jeffrey Green and Mr. Steven Heard … then was told that Steven Heard would be taking the lead inspector role and would be performing the airworthiness inspection on the DOG Aviation RV-12 under Mr Greenlief's supervision. Steven and I shared an instant camaraderie …. the airworthiness inspection would be a first for each of us. After the pleasantries were out of the way, the inspection process began with verification of the paperwork I submitted to the FAA. The Rotax engine model and serial number provided by me on the forms were compared to the placard on the engine along with verifying the propeller’s model number. Next the information engraved on the data plate riveted onto the side of the fuselage was verified for accuracy and that it matched the registration PRECISELY, then verification that the N number was correct and on both sides of the aircraft. The builder’s log was looked at along with the photos taken of me performing the assembly to prove I built more than 51% of the aircraft. A comment was made that it was obvious I built the aircraft over a period of time because the shirts worn in the photos were all different. Guess some guys have tried to claim they built 51% of the aircraft and have showed a hand full of photos with the guy wearing the same shirt in every photo … duh! A review of the forms that will be sent to Oklahoma City was made along with reviewing the imposed operating limitations, Phase One fly off hours and geographical flight testing area requested by me in the Program Letter sent to the FAA many weeks earlier. For those not familiar with the process, when an experimental aircraft first receives an Airworthiness Certificate the first flights are conducted under restrictions called Phase One. While under Phase One restrictions, the aircraft needs to be flown for a certain number of hours (40 in my case, which is typical for an experimental-amateur built aircraft) and the flights are restricted to within a set geographic area (typically a 25 mile radius from the home airport) … all this is spelled out in the Operating Limitations. Because the typical 25 mile radius would have taken me well into the Cleveland Class B airspace and also over densely populated areas (both a no no during Phase One testing), stating my safety concerns, I requested in the Program Letter (and was granted) a large trapezoid shaped area to the south of my home airport that is predominantly over farm country. I still have approximately the same total square miles to fly within as there would be with a 25 mile radius … but is just in a southerly direction from my home airport. Another stipulation during Phase One testing is no passengers can be taken for rides while still in Phase One testing. When the Phase One testing period is completed after the 40 hours have been flown off … and assuming there have not been any major issues encountered, the shackles are removed allowing the aircraft to freely fly around the country and passengers are allowed to accompany the pilot. 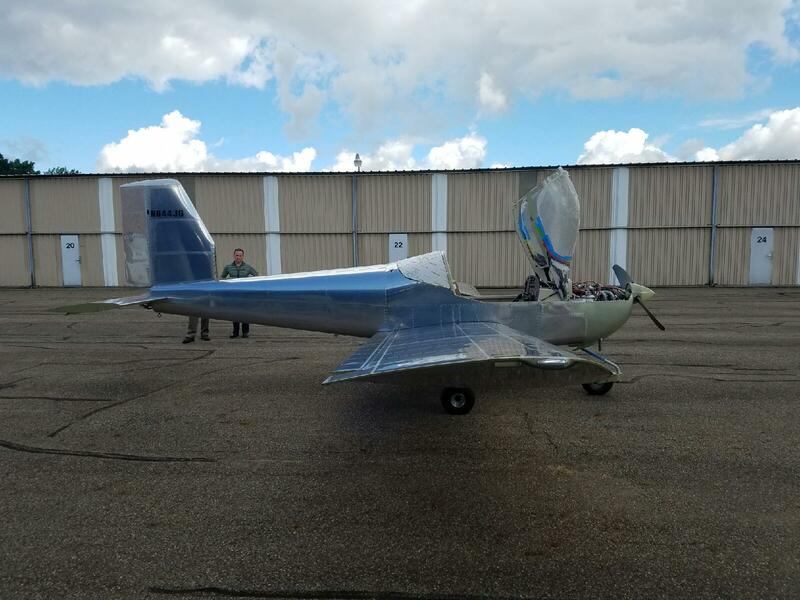 While I was reviewing the above mentioned Operating Limitations, the FAA inspectors were going over the RV-12 making sure the controls moved freely and in the correct directions. The ELT was asked about and an inspection of the instrument panel was made to verify all the controls, switches and fuses had the appropriate labels or placards. After the RV-12 received a good looking over, I was asked to prepare the airplane for an engine start because they wanted to verify there were no oil, fuel or coolant leaks … so the lower cowl was installed, seat pan temporarily set in place along with the seat cushions and the RV-12 was pulled outside the hangar. Because the fuel tank was dry from having done the weight and balance measurements with the required zero fuel in the tank, had to throw a couple of gallons of fuel in the tank for the engine run. After a brief engine run, I was given the signal to shut down so the firewall forward area could be checked for leaks … no leaks were found. 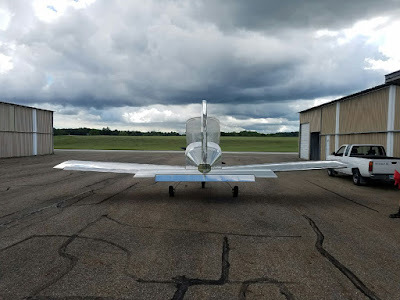 The RV-12 was rolled back into the hanger and four years plus a hand full of weeks after construction on the DOG Aviation RV-12 first began, I was awarded the sought after “pink slip” … the FAA Special Airworthiness Certificate. FAA Small Airplane Directorate Mr. Steven Heard presenting me with a “pink slip” … the coveted Special Airworthiness Certificate stapled to the operating limitations. 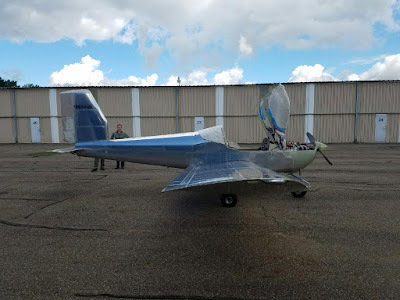 While the DOG Aviation RV-12 was outside for the run up, Steven took a few photos that he was kind enough to pass on to me which are posted below. In the background, from left to right Mr. Jeffery Green, Mr. Richard Greenlief and myself. In the background, Mr Richard Greenlief waiting for me to put some fuel in the tank for an engine start. So when is the first flight going to be? Not sure honestly. Now that I know I will not need a follow-up appointment with the FAA, the plan is to get some transition training in a RV-12. This will involve traveling to a flight school that has a RV-12 and actually flying one of the factory built RV-12’s. The insurance company is requiring 5 hours of transition training in the RV-12 before I’m covered during the DOG Aviation RV-12’s first flight, but I plan to spend a little more time than that to become VERY comfortable with the RV12. I’m hoping that the transition training can take place sometime next week assuming no issues are found with the flight center’s RV-12 which will be down in a day or so for a mandatory 100 hour inspection.